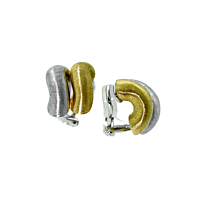 Diversity mingles with simplicity in the design of these 18-karat white and yellow gold earrings. 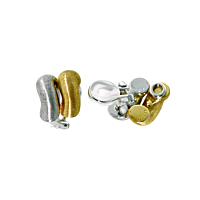 The warm tones of the yellow gold merge with the coolness of the white gold to create an earring set that takes away the challenge of trying to choose your favorite gold hue. The earring set's arc shape formation highlights the graceful curve of the wearer's neck, and since the engraving work was done by hand, this earring set exhibits fine styling and quality artisanship.